Erbil- Iraqi forces began storming ISIS-held Old City of Mosul on Sunday, in an assault they hope will be the last in the eight-month-old campaign to seize the militants’ stronghold. Commanders said that the terrorists are putting up fierce resistance and there are fears for more than 100,000 civilians believed to be trapped in the maze of narrow streets. 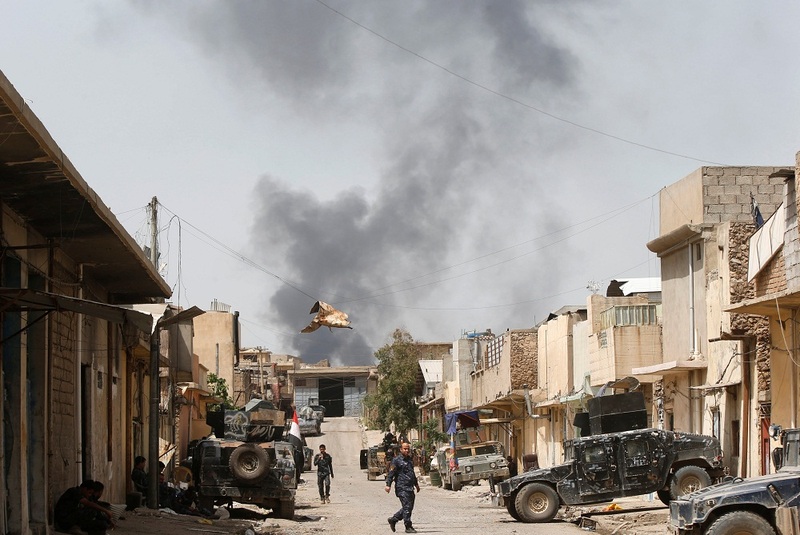 For his part, Staff Major General Maan al-Saadi, a top commander in Iraq’s elite Counter-Terrorism Service (CTS), told AFP that heavy fighting had resumed at dawn on Monday. “At 6:00 am. we pushed deeper into the Old City and took control of new areas in the Faruq neighborhood,” Saadi said. “ISIS resistance has been fierce,” he added. The push into Mosul’s historic heart on the west bank of the Tigris River marks the culmination of a months-long campaign by Iraqi forces to retake the terrorist group’s last major urban stronghold in the country. The US-led coalition battling ISIS in Iraq and neighboring Syria has backed the offensive with months of airstrikes. The loss of Mosul would mark the effective end of the Iraqi portion of the cross-border “caliphate” which ISIS declared in the summer of 2014 after seizing swathes of land in Iraq and Syria. Sheltering from relentless fire and explosions near a sniper position on the edge of the Old City, CTS Captain Ahmed Jassem described a bitter fight. “We can’t bring our vehicles into these narrow streets. It means they can’t use as many car bombs either, but they use motorcycle bombs and even IEDs mounted on remote-controlled toy cars,” he said. Iraqi forces stationed Humvees by the Grand Mosque on the retaken east side of Mosul, facing the Old City and mounted with speakers. The leaflets urged civilians to “stay away from open places and… exploit any opportunity that arises during the fighting” to escape. The United Nations said Friday that ISIS may be holding more than 100,000 civilians as human shields in the Old City. On Monday, the French national broadcaster France Televisions and Reporters Without Borders said three French journalists were wounded in a landmine blast in Mosul and their Iraqi fixer Bakhtiyar Addad killed. Only a few hundred meters from the heaviest fighting, small groups of civilians gathered. “We moved to a camp in Hammam al-Alil when the neighborhood was liberated, but homes were being looted so we came back to protect our property,” said Nabil Hamed Khattab, a 56-year old who did not flinch when a mortar round came crashing down a few blocks away. Commanders have said the fighting is expected to be very difficult and could last weeks. Surrounded by Iraqi forces on three sides and blocked on the other by the Tigris that runs through Mosul, ISIS militants are cornered.